Dhanaulti is a fast emerging travel destination in Uttarakhand. It is located on Mussoorie – Chamba road. Being situated at an altitude of 2,250 meters above the sea level is pleasant throughout the year. It is a perfect weekend gateway for the travel lovers and vacationing this place is altogether a different experience. Dhanaulti is away from the busy city crowd, so the tranquility of this place is prime attraction relaxing holidays. This place is nestled amidst thick forests of Deodars, Oaks, and Rhododendrons, this place has a perfect location that ensures absolute peace of mind and soul. Dhanaulti is located in the proximity of the popular hill stations of Uttarakhand such as Mussoorie, Tehri, Kanatal, and Chamba. The less explored Dhanaulti is having green meadows, breathe taking views of snow-capped Himalayas. The beautiful landscape has all the reasons to fall in love with this place. This place may not offer fancy hotels; luxury suites, may not offer modern eateries, but it’s a perfect place for a peaceful holiday. The official language of Dhanaulti is Garhwali and Hindi. By Air – the nearest airport from Dhanaulti is Jolly Grant Airport. It is located at a distance of 83 km. By Rail – the nearest railway station from Dhanaulti are Rishikesh and Dehradun. Rishikesh Railway station is 83 from Dhanaulti. Dehradun railway station is 60 km away from Dhanaulti. By Car – travelers can take the private taxi and private buses are available too on a regular basis from Rishikesh, Mussoorie, and Dehradun from Delhi. Best time to visit Dhanaulti is from March to June. Due to higher altitude travelers can enjoy amazing holidays with beautiful landscape. Tourists flock to Dhanaulti during this time to get away from the heat in the mainland. Winters are very cold, so not advisable for travelers. Monsoon is marked with heavy rainfall. This is one of the 51 Shakti Peeth located all over the Indian Subcontinent. This temple is located at an altitude of 2700 meter and it offers the 360-degree view of the surrounding region. The view of snowy Himalayas is enchanting. This temple is attributed to Goddess Sati, Wife of Lord Shiva. This temple is located in Chamba-Mussoorie road. It is located from 6.7 km Dhanaulti. Travelers love to visit this temple and seek divine blessings. This temple at Dhanaulti is the earliest known Panchayatan temple in North India. It was built during the Gupta Empire and is dedicated to Lord Vishnu. The side walls of the Dashavatar Temple are adorned with carved inscriptions of Vaishnava mythology. This fort is one of the popular destinations among tourists. It was built in the 16th century. This fort includes ornamented palaces and artistic Jain temples. The elaborative designs of the massive Jain temples and the intricate architecture are the prime element of this fort. The fort comprises of a number of striking palaces, ornamented with frescoes, and impressive Jain temples. Due to fewer accommodation options in Dhanaulti, it offers so many sites for camping and adventure activities too. Tourists can take tents on rent or they can buy tents too. both the options of camping are available in Dhanaulti. This camping site is located at 8300 ft. The Thangdhar Camp, approximately 14 km away from the main market in Dhanaulti is by far the best adventure camp in the vicinity. It is one of the famous place in Dhanaulti among adventure lovers. The Camp Thangdhar is the perfect place for tourists to blend with nature being a part of daring activities. In this camp, you will feel close to Mother Earth. The place offers lush green views the camping is very captivating and beautiful in this place. Tourists can enjoy abseiling, Jumaring, Rock Climbing, Trekking, and Snow Walks. So if you are adventure soul head towards Camp Thangdhar in Dhanaulti, and let the adrenalin rush at peak and enjoy climbing. The camp is opened 24 hrs but the adventure activities are carried out during day time only. This place is perfect for a romantic time with your special one too. Tourists will experience nature and the charm of the Himalayas in non-adulterated form. No pollution at all. Outdoor activities at camp include river crossing, rock climbing, rappelling, commando net, zigzag bars, trekking, badminton, and mini basketball. Entry fee: Package cost is INR 2,000 person and INR 1,500 per person for a group (15 or more PAX). Life is nothing without adventure and when you get the adventure opportunity in such a beautiful place then you should admire your luck. Kanatal Adventure camp is situated at 8,500 fts in Mussoorie Chamba Road (near Dhanaulti) at the distance of 310 Kms/8 hrs from Delhi/NCR. This unseen adventure camp is nestled between deep Oaks forest. Long wooden slopes of Deodar are really charming. The camp offers beautiful views of landscape and captivating environment which is pure bliss in such a polluted world. The camp is having 11 Bamboo Cottages and 10 camps, Each cottage has attached washroom with running water facility. They provide 24hrs. supply of electricity with an adequate backup facility. So this time when your heart says camping, then just make this camp as your first choice and have a lifetime experience. 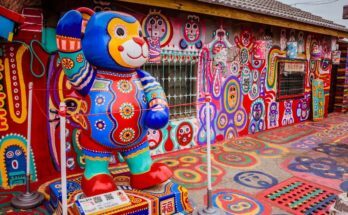 This is an offbeat location and it offers tranquility to uncover yourself and feel connected to your soul. The prime attraction of this camp will include Trek to Pine Forest, Burma Bridge, Mowgli Walk, Zig Zag and Rock climbing. There are outdoor activities like rock climbing, valley crossing as well as indoor games like cards, carrom, and chess. There are also bonfires and barbeques at night. Dhanaulti Adventure park is famous for its beautiful natural landscape views and thrilling adventure activities. It is located on the apple orchard and I am a perfect gateway from the chaotic city life. It is located on Mussoorie Chamba road at an altitude of 2,250 meters. Tourists can take treks to Top Niba and Surkanda Devi and go for mountain biking, rappelling, horse riding, and camping. The prime attraction includes Sky Bridge, Sky Walk, Zip Lining, Zip Swing, Rock Climbing, Rappeling, Trekking, Mountain Biking, ATV Ride, Paragliding and Camping. The best part about the Dhanaulti Adventure camp is that it’s got something for everyone making it the perfect place to visit for families and large groups of friends. Price – Approx INR 300-10,000 Per Person. Read more:- Cottages in Lansdowne for those who seek serenity and peace. The unusual tourist attraction is Potato Farm in Dhanaulti. This is also known as “Aloo Khet” in common language. It is a vast stretch and tourists can see only potatoes till the last stretch. This potato cultivation is a joint effort of local agricultural farmers and government. Kids will enjoy visiting the potato farm and they have lots of things to see and know about the potato. Fare – INR 25 Per Person for Adults, for Children INR 10 per child. The Ambar and Dhara, these twin parks are among the top list of tourists. The forest department of Uttarakhand developed and maintained these two Eco parks in Dahanaulti. The beautiful deodar and cedar trees are very charming in these parks. The eco-parks of Ambar and Dahara is a fun place for families and kids. 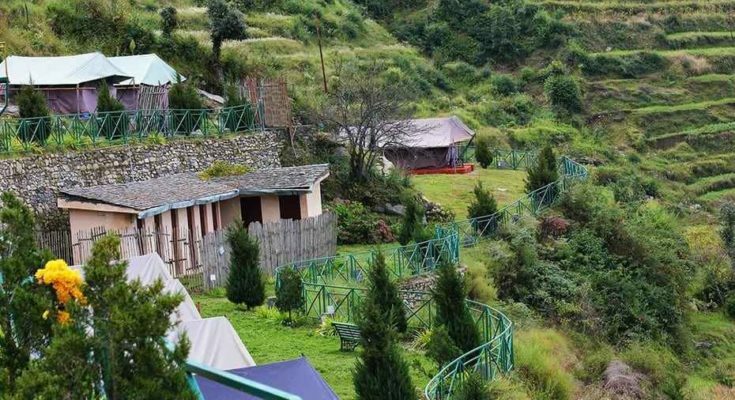 The Karma Vilas Resort in Dhanaulti is very famous for its 13 lavish rooms, beautiful surrounding views, best dining restaurant and of course the lush green garden. It is located in the Bala Hisar area of Dhanaulti. It is nestled at the height of 6000 feet on a hilltop. 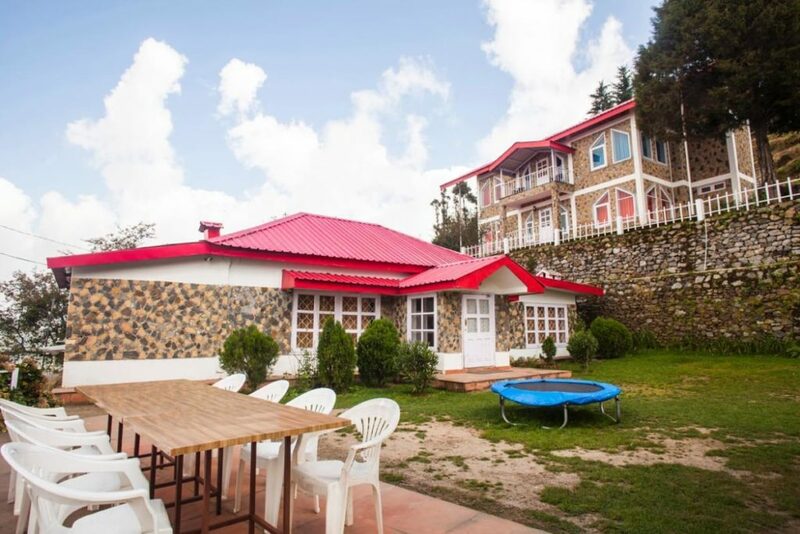 It has the finest architecture in Dhanaulti as it is a colonial mansion which was renovated and turned into a resort. This resort deluxe category, presidential suites to wood cottages. It is the most famous resort in Dhanaulti. It is located on amid luxuriant apple groves, on the Dhanaulti – Chamba Road. This resort has 15 luxury rooms. The stunning views of pine and deodar forests and snow-capped the Himalayas are mesmerizing. Tourists can enjoy a comfortable stay with other amenities like in house kitchen, lush green garden, etc. The free parking is also available in the resort. 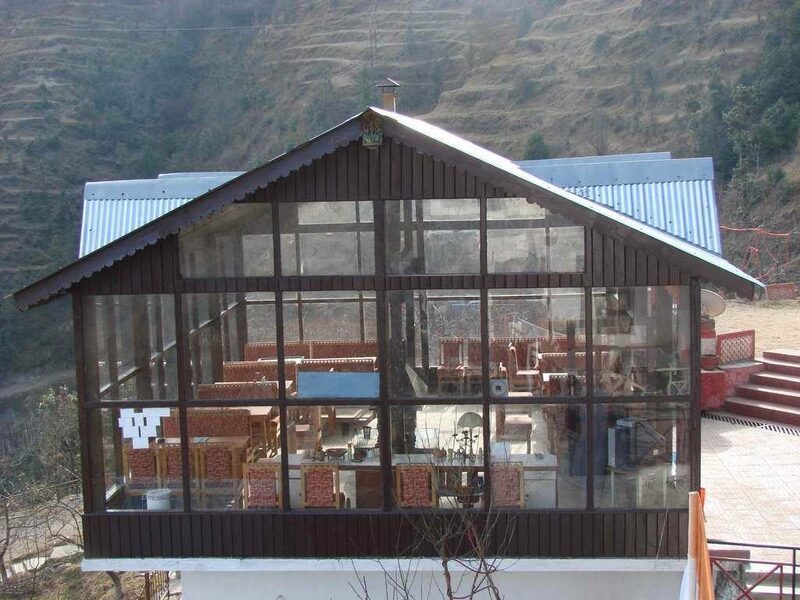 This resort serves authentic Garhwali food, the other prime attraction is the glass house restaurant. This resort in Dhanaulti is famous for its mouth-watering dishes and relaxing stay. It has lip-smacking in –house restaurant. 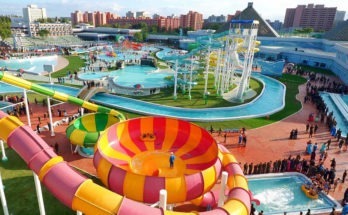 Various kinds of adventure activities are also offered by this resort. The adventure activities for guests are trekking, rappelling mountain biking and golf. The tourists enjoy the spectacular view of snow-capped Himalayas and whispering palm boasts. The resort organizes the camp, snow treks and sledding for its guests, on advance requests. 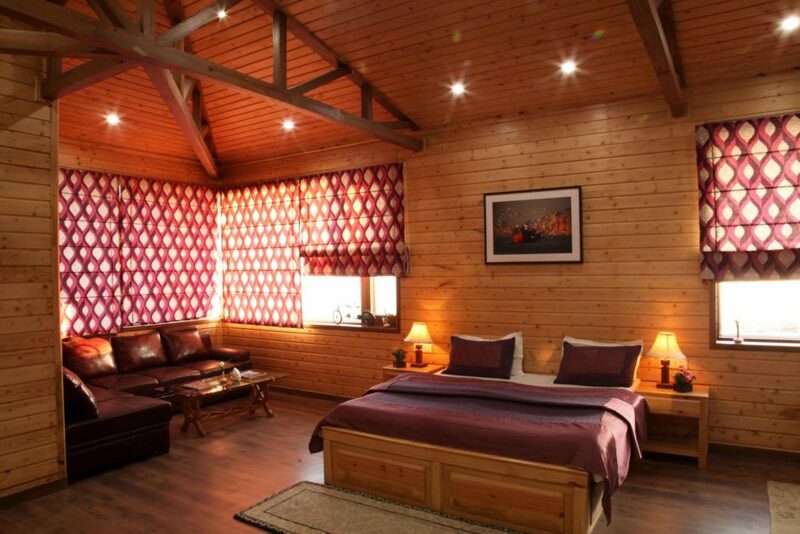 This resort is among the best luxury resorts of Dhanaulti. The resort offers spa too, this is the best part to pamper your body and soul at this luxury resort. The special attraction of this resorts includes moonlight trailing and star gazing. 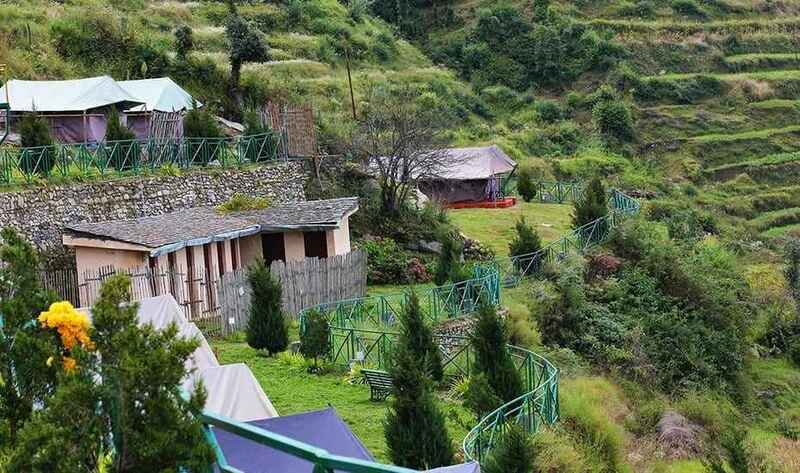 For nature and thrill loving travelers, Dhanaulti offers camp homes and natural resorts. The most amazing part is that travelers need to trek 15-20 minutes to reach these camp homes. The mind-blowing camp homes are nestled amidst the Himalayas and thick pine forest. These camp homes are fully furnished and pet-friendly too. The guests can enjoy adventure activities like hiking, bonfire, trekking, and rock climbing. If you want to enjoy packed lunch and dinner at these camp homes, then prior booking is recommended. Fare – INR-3147 Per night. This resort is well known for its serene and picturesque views and beautiful location. It is spread across a 19-acre apple garden. The charming view of forested valleys and snow-capped mountains will give you a lifetime experience. The rooms are spacious, neat and well furnished. The other amenities are played zone for kids and a garden restaurant. If you want to enjoy a bonfire and live barbeque in their garden, then the prior request needs to be made. Fare – INR 3000 Per night. So this vacation comes to Dhanaulti and explore the hidden beauty of Uttrakhand and enjoy the charming views of the snow-capped Himalayas, long wooden thick pine and deodar forest and let the blood flow and heart skip a beat with the adventure activities at Dhanaulti. I am sure this place will give you a thousand reasons to come back to this place and incredible diary of memories which you will cherish your whole life through. Read more:- Have you ever visited the unknown hill station of Jeolikote at Nainital?